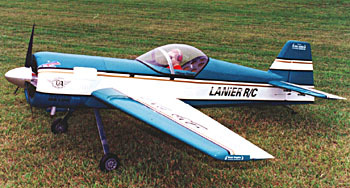 The Sukhoi is a laser and CNC router cut all wood kit with foam wings and tail cores fully sheeted with balsa. The wings and stabilizer are two-piece and removable. It comes with a fiberglass cowl, and contains a laser cut instrument panel with printed gauges. The kit comes complete with main landing gear, all wood and clear canopy. No other hardware is supplied. Flying Weight: 38 - 40 lbs.